Humans and animals that posses a relatively large separation between ears, compared to the wavelength of sound, utilize the delay of sound arrival between ears to sense its direction with relatively good accuracy. This approach is less effective when the separation between ears is small, such as in insects. However, the parasitic Ormia Ochracea fly is particularly adept at finding crickets by listening to their chirps, though the separation of their ears is much smaller than the wavelengths generated by the chirps. The female of this species seek out chirping crickets (see Fig. 1) to lay their eggs on, and do so with an accuracy of few degrees. The two eardrums of the fly are separated by a mere 1.5 millimeters (mm) yet it homes in on the cricket chirping with 50 times longer wavelength where the arrival time difference between ears is only a few millionths of a second. It is interesting to note that Zuk and coworkers found that “between the late 1990s and 2003, in just 20 or so cricket generations, Kauai’s cricket population had evolved into an almost entirely silent one” to avoid detection by the flies. 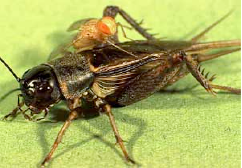 The studies carried out on the fly’s hearing organ by Miles and coworkers in the mid-90s found that workings of the fly ears are different from that of the large species and are mechanically coupled at the middle and tuned to the cricket chirps giving them remarkable ability locate them. Figure 1 Ormia Ochracea uses direction finding ears to locate crickets. 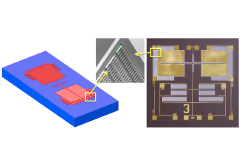 In this paper, we present a miniature directional sensor that was designed based on the fly’s ears, which consists of two wings connected in the middle using a bridge and fabricated using micro-electro-mechanical-system (MEMS) technology as shown in Fig. 2. The sensor is made of the same material used in making microchips (silicon) with the two wings having dimensions 1 mm x 1 mm each and thickness of less than half the width of human hair (25 micrometers). The sensor is tuned to a narrow frequency range, which depends on the size of the bridge that connects the two wings. The vibration amplitudes of the sensor wings (less than one millionth of a meter) under sound excitation was electronically probed using highly sensitive comb finger capacitors (similar to tuning capacitors employed in older radios) attached to the edges of the wings. It was found that the response of the sensor is highly directional (see Fig. 3) and matches well with the expected behavior. Figure 2 Designed (left) and fabricated (right) directional sound sensor showing the comb finger capacitors for electronically measuring nanometer scale vibrations generated by incident sound. The size of the entire sensor is less than that of a pea. 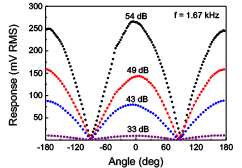 Figure 3 Measured directional response of the sensor tuned to 1.67 kHz for a set of sound pressures down to 33 dB. The sensor was able to detect sound levels close to that of a quite whisper 30 decibel (dB) which is thousand times smaller than the sound level generated in a typical conversation (60 dB). The sensor has many potential civilian and military applications involving localization of sound sources including explosions and gunshots.